Srinagar: Strongly condemning the Enforcement Directorate (ED) notice to daughters of jailed pro-freedom leader Shabir Ahmad Shah, Chairman Hurriyat Conference (G), Syed Ali Geelani said that “Indian rulers are using their investigative agencies as a war weapon to strangulate the people in general and pro-freedom workers and leaders in particular”. He said that Shabir Ahmad Shah has spent most of his life in Indian jails and today also he is lodged in the Tihar jail for the last 2 years. 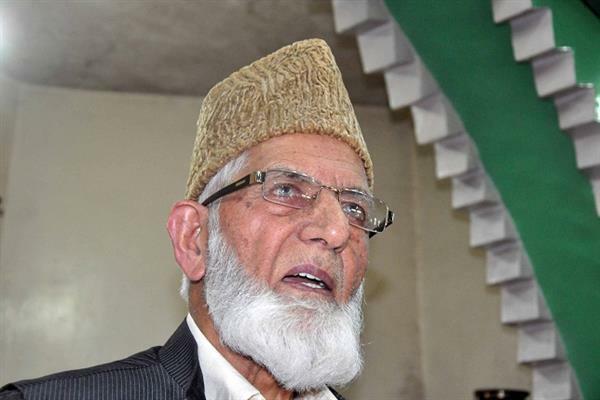 Geelani said Shah is in the custody to answer any question and issuing notices to his minor daughters is not only “undemocratic, immoral but shameful as well”. Reacting to the JKLF chief Mohammad Yaseen Malik’s arrest by NIA and shifting him to Tihar jail, Hurriyat chairman said that pro-freedom leaders and workers are not alien to these jails and interrogations. Hurriyat Conference (G) chairman said that continued quizzing of Mirwaiz Umar Farooq for 4 consecutive days is nothing but to threaten the leadership to stay away from the genuine demands of the people of Jammu and Kashmir, but as said earlier, these muscular tactics are sure to strengthen our resolve more than earlier. Pro-freedom leader said that shifting of Jamaat-e-Islami and other religious leaders to outside jails, is condemnable and the rulers who always claim to uphold the democratic values of their constitution are themselves responsible to tarnish every fabric of it. Repeating the appeal for complete poll boycott, Hurriyat chairman said that people who are suppressed, caged, brutalized and maimed on one or the other pretext have no moral and ethical right to be part of “any military drama being conducted in the name of so-called elections”. Meanwhile, Hurriyat Conference (G) chairman, Syed Ali Geelani expressed his deep grief and sorrow over the killing of youth Uwais Ahmad Mir by orces at Mandigam Kupwara.